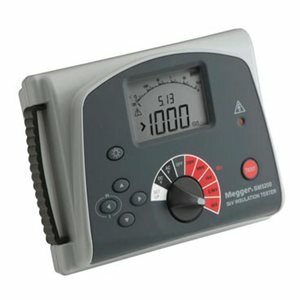 Megger BM5200 is a battery powered insulation tester with digital and analogue arc display, designed for high voltage insulation resistance testing in the maintenance and servicing of cables, rotating plant machinery, transformers, switchgear and industrial applications. DC insulation tests are performed at 250 V, 500 V, 1000 V, 2500 V, 5000 V. Insulation resistance measuring range is 100 k Ω to 1000 G Ω. Automatic discharge for capacitive circuits under test is provided and decaying voltage displayed. The guard terminal can be used to minimize the effects of surface leakage and hence erroneous measurements when carrying out insulation resistance tests.